Get Rid of Fleas on Your Dog Once And For All! You want to get rid of fleas on your Cocker Spaniel, but it's not just about killing the fleas, it's also about active, ongoing flea prevention to help kill off the eggs, the larvae, and the pupa as they develop and hatch into fully grown adult dog fleas. Read on to learn how it's done! Get Rid Of Fleas - Permanently! No-one said getting rid of fleas was going to be easy! 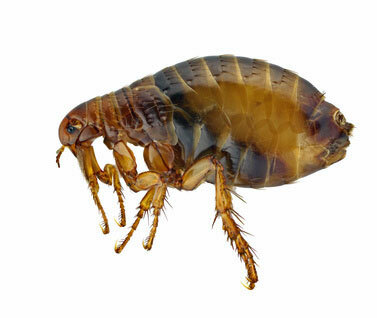 Dog fleas are one of the most annoying parasites that will ever find their way into your home. They spend most of their time in your dog's coat but will also take up residence in your carpets, crevices in your floorboards, underneath low-lying furniture. In fact, you'll find them anywhere where it's warm and dark. Once you're familiar with the life cycle of dog fleas you'll soon realize that one treatment won't always be enough. The first treatment may kill off the adult fleas, but you'll also need to continue with further treatments until all eggs, larvae and pupa are either removed or have developed into adult fleas and killed off by a suitable treatment. Read on to learn how to get rid of fleas in your Cocker's coat and banish them for good! Begin by bathing your dog; wash him thoroughly, making sure you create lots of soap suds and rub them into all the nooks and crannies. There are many specialist shampoo treatments for dog fleas available or your vet may recommend one to you. This is a great way of getting rid of fleas because they can't get a grip on the hair and they literally drown in the watery soap suds! Don't rinse his coat at this stage because you want to shampoo to get working and do its jog. Your also need to try to comb out as many as you can. Using a flea comb, work through your dog's wet, soapy coat, section by sectionto remove any remaining fleas or eggs. Keep a separate bowl of soapy water nearby and dip the comb into the bowl after combing each section to clean the comb and 'drown' the fleas. As you work, you may see some of the fleas coming up to the top of your Cocker Spaniel's coat. Just pick them off and put them in the bowl of soapy water. When you've finished combing your Spaniel it's time to rinse off the shampoo. If you choose to shampoo his coat a second time (or the manufacturer's recommend it) I recommend you comb through your dog's coat once more to help you remove as many fleas as you can. Rinse your Spaniel's coat several times to make sure all trace of soap is removed, otherwise it could cause itching or skin problems, particularly as it's a medicated shampoo. So make sure you really rinse him off well. When you're certain there are no more soap suds, dry your dog thoroughly, paying particular attention to his ears, 'armpits', and under his tail as these are places where dog fleas love to feed. If parts of his coat are left damp, these moist areas may encourage the fleas to lay more eggs. I'm sure we all agree that getting rid of fleas isn't easy and once you've managed it, the last thing you want is for them to return. You can help to avoid a repeat infestation by applying a monthly flea treatment to your Spaniel. Some will only kill adult fleas, but other treatments are available to kill fleas as well as preventing any further development of the eggs, larvae and pupa. You can pick up many effective flea treatments either on-line or in good pet stores. Alternatively, your vet may prescribe something for you or you can ask him about natural flea control if you prefer a more holistic approach. After treating your dog for fleas, you'll probably continue to see a few adult fleas as the immature forms continue to develop (unless you've used a treatment that halts this development). Continue bathing your boy and using the flea comb until you're certain that there are no more fleas or eggs present. Once you've managed to get rid of these pesky critters, checking his coat regularly and keep a watchful eye open for tell-tale scratching. You can always check more thoroughly each time you groom your Cocker Spaniel. Continue using the preventative flea control each month to help keep him clear. Unfortunately, getting rid of fleas on your dog is only the first step. You'll also want to be certain that you get rid of fleas living in your home and prevent them from re-infesting your pet! Learn how to banish those pesky parasites from your home...for good!